The funnel has been used for decades to model the journey a customer takes during the sales cycle. While it is still very effective as a forecasting tool, it falls short as an effective model of the overall customer journey, especially in the context of recurring revenue customers. 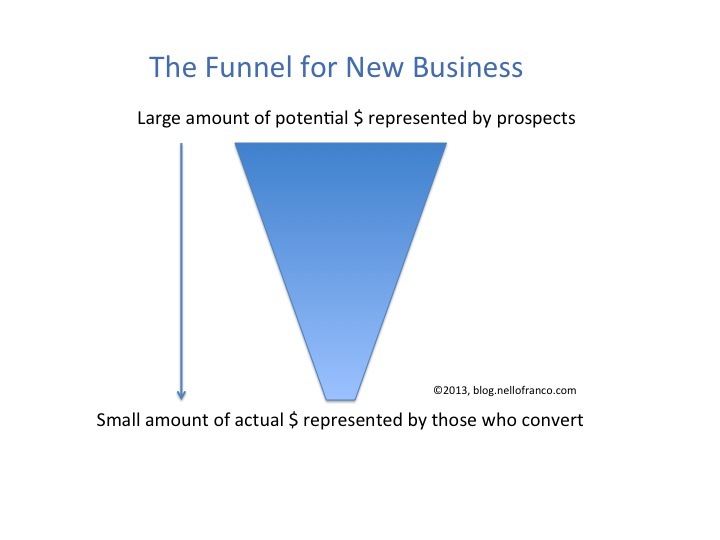 The cultivation process for identifying and processing new leads, then moving them through the steps to an initial commitment to your product is still best modeled by a funnel, and most of the common sales methodologies to date only support a funnel metaphor. I get it. Going though the qualification process and filtering a bunch of unqualified leads to qualified leads to qualified suspects and so on through the process is best illustrated and managed as if all these were going through a funnel with an expected conversion rate at each stage of x%, y%, and z%. In a world centered around new customer acquisition, this seems like a pretty good metaphor and it also helps provide forward visibility and predictability into new revenue for somewhat mature organizations; however when it comes to: A) capturing the journey once someone becomes a customer, especially one with multiple transactions; and B) predicting recurring revenue from an existing customer base, the funnel metaphor doesn’t work. There is a strong tendency, even in the world of SaaS, to look at all revenue the same way. With any recurring revenue model, the focus needs to shift from a sales-centric perspective to a customer-centric perspective. Again, I’m not trying to minimize the importance of sales and new customers, or the predictability and management of that revenue stream. New customers and new revenue are vital to the growth and success of any organization. They just aren’t the end game of a sustainable recurring revenue business. They’re only the beginning. 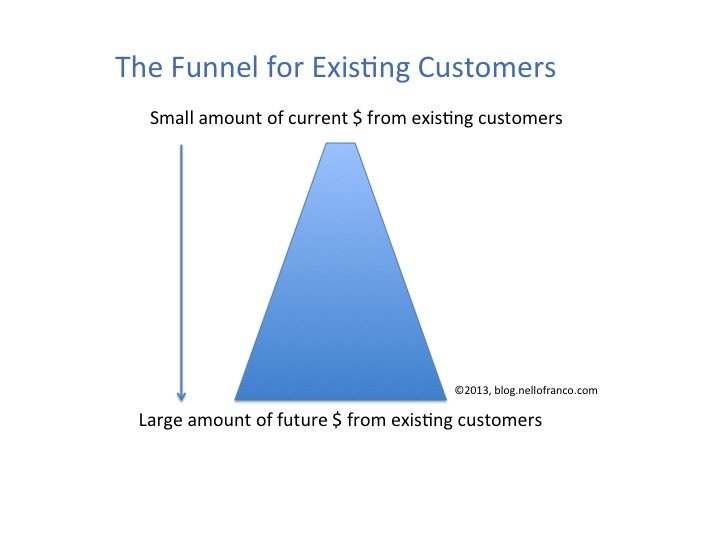 So if the funnel isn’t the right metaphor for ongoing customers, what is? Some great minds have spent considerable time and effort on this problem and have come up with some good alternatives as a starting point. A funnel implies that significantly less revenue comes “out” of the funnel than entered the funnel in the form of leads – as shown in the image below. Again, this is a good assumption when managing and forecasting new business. However, for an existing customer base in a healthy growing business with a good “land and expand” strategy and execution, the revenue that comes out of every cycle through the ellipse for the overall customer base should actually increases as a result of up-sells and cross-sells – as shown in the next figure. Yes, some customers will (gulp) churn; however with a healthy business model and a good upsell/growth model and “land and expand” strategy, this net revenue should increase for your installed base of customers. Seth Godin, in his ebook Flipping the Funnel, as well as Joseph Jaffe, in his book Flip the Funnel, both discuss how you can use your existing customer base as advocates to market to additional prospects. Are Rumors of the Funnel’s Death Greatly Exaggerated? I don’t believe the funnel is dead. I think it still serves a purpose for predicting revenue and conversions, especially for new business. From a marketer’s perspective, however, and when trying to manage an existing customer base, the metaphor falls way short. The continuous elliptical path provides a much more realistic model for the customer journey and influence path. The next step is in applying metrics to the elliptical path in order to forecast recurring revenue so that it can be as effective as the funnel as a forecasting tool. Hmmm… I bet that would make a good topic for a blog post. ← Are You Empowering Your Customers, or Are You Simply Enabling Them?